The bright, brilliant fashion of the 1980’s has often been captured on film- the over the top nature of the clothes lends itself beautifully to cinema, with some of the most iconic outfits of all time captured in this era. To celebrate the home entertainment release of A Most Violent Year , in which Jessica Chastain showcases an incredible array of 1980’s era Armani, we take a look at other films which demonstrate the fashion of the decade. The ethics of an honest man collide with the brutal violence of 1980s New York in JC Chandor’s instant classic. Set in 1981, when New York City experienced an unprecedented spike in criminal activity, small businessman Abel Morales (Oscar Isaac) fights to make a living, support his wife Anna (Jessica Chastain) and protect his interests. Chastain in particular models some incredible outfits- she strongly believed that her headstrong, nouveau-riche character would only wear Armani, and wrote to the fashion house to request that they lend their costumes to the film. They were happy to oblige, and so every single outfit Anna wears is vintage Armani from 1981... including some absolutely stunning coats and sunglasses. Richard Ayoade’s comedy drama stars Craig Roberts as 15-year old Oliver Tate, who has two major ambitions- to lose his virginity to the beautiful Jordana (Yasmin Paige) and to save his parent’s rocky relationship (a task made all the more difficult when his mother’s ex-lover reappears in their lives). Costume designer Charlotte Walters does a brilliant job of capturing the wonderfully quirky take on the classic coming of age tale, dressing the young cast in a wonderful array of duffle coats, satchels and Wayfarers. Jesse Eisenberg, Kristen Stewart and Ryan Reynolds star in this comedy drama set in a 1987 theme park. Eisenberg plays college student James Brennan, whose dreams of a summer in Europe are crushed after his parents suffer a major financial setback. James is forced to get a summer job to cover his upcoming college expenses at the decrepit local amusement park Adventureland, where he falls in love with his co-worker Emily Lewin (Stewart). The fashion is pretty understated throughout, but there are some fantastic high-waisted jeans and shorts on display, as well as an abundance of very impressive moustaches. Shane Meadows’ semi-autobiographical drama about his experiences growing up in 1980’s England offers an unflinching look at the racial tensions which marred Thatcher’s Britain, with standout performances from newcomer Thomas Turgoose, Vicky McClure and Rosamund Hanson. The film brilliantly brings 1983 to life, in no small part due to Jo Thompson’s costume designs, which offer a wonderfully vivid depiction of mods, skinheads and New Romantics fashion as it took hold of the country. This wonderfully offbeat rom-com united Adam Sandler and Drew Barrymore for the first time, recounting the lives and loves of wedding singer Robbie Hart (Sandler) in 1985. When his fiancé leaves him at the altar, he’s left heartbroken, and seeks solace in his new friendship with cocktail waitress Julia Sullivan (Barrymore), who needs help planning her own wedding to the insufferable Glen (Matthew Glave). However, the ensuing planning only brings them closer together, leading to an inevitable showdown. Mona May’s costumes are wonderfully outrageous, and include Miami Vice- esque suits, ludicrously over the top perms and an abundance of lace accessories- while Sandler rocks a particularly memorable mullet. Michael Lehmann’s classic black comedy took the genre of teen movies and well and truly subverted it into something much darker – it’s since become a cult classic, not least due to the incredible 80’s fashions showcased throughout the film. 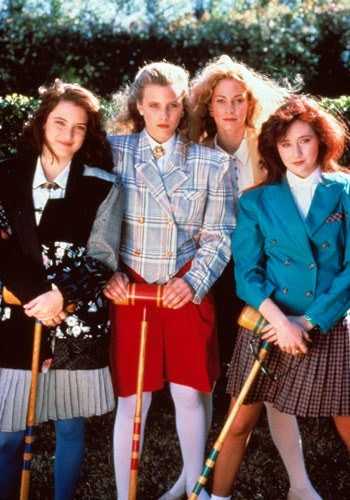 Plaid skirts, braces, big shoulders and velvet all take centre stage, and an additional surreal dimension is provided thanks to costume designer Rudy Dillon’s decision to assign each of the main characters a colour - power-hungry red for Heather Chandler (Kim Walker), cowardly yellow for Heather McNamara (Lisanne Falk) and jealous green for Heather Duke (Shannen Doherty) — with Winona Ryder’s Veronica given a foreboding wardrobe of black and dark blue. Mike Nichols razor-sharp romantic comedy stars Melanie Griffiths, Sigourney Weaver and Harrison Ford and can take a huge portion of the credit for catapulting the ‘power dressing’ trend into popular culture. Outrageously back-combed hair, eyeshadows in every colour of the rainbow, and shoulder pads take centre stage, with the gradually changing wardrobe of lead Tess (Griffiths) offering a glimpse into her changing attitude and position in the workplace. The undisputed king of 80s teen movies, John Hughes’ films live on not just because of the timelessness of his tales of adolescent angst, but because of the incredible fashion showcased in every single film. The Breakfast Club is the obvious choice, as each ‘high-school stereotype’ character models an iconic outfit, including Molly Ringwald’s pristine princess ensemble, rebel Judd Nelson’s leather gloves, outcast Ally Sheedy’s alternative look and Emilio Estevez’s classic letterman jacket. Special mention must be made of Hughes’ other two classics- in Pretty in Pink Molly Ringwald wears a stunning array of bright and beautiful dresses and skirts, and Andrew McCarthy showcases the oversized pastel suits and collars of the decade, whereas in Ferris Beuller’s Day Off, Matthew Broderick’s sweater vests/ slacks combo and Jennifer Grey’s classic leggings, leg warmers and oversized cardigans take sartorial centre stage. Madonna and Rosanna Arquette co-star in this comedy about bored housewife Roberta (Arquette), who wakes up with amnesia after an accident, and is mistaken for free-spirited New York City drifter Susan (Madonna). The film showcases several iconic 80’s looks, including an oft-cited silk bomber jacket with an embroidered back which causes all manner of mix-ups. Other classic looks featured include perms, oversized hair accessories, lace gloves and harem pants. Jennifer Beals stars in this romantic drama as Alex Owens, a Pittsburgh steelworker by day, and an exotic dancer by night. Harbouring dreams of a ballet career, she is given financial support her boss and love interest Nick Hurley (Michael Nouri) and moral support by the kind-hearted instructor Hanna Long (Lilia Skala). The film's signature fashions include dancewear trends of oversized t-shirts, legwarmers and of course, perms, along with masculine-inspired casual wear and an infamous scene involving Alex arriving at a fancy date wearing a man’s tuxedo, minus the shirt.